The Most Legendary Garment in American History: Whatever Happened to Jackie's Blood-Stained Pink Suit? Several times Jackie was offered a washcloth and a change of clothes, but she said, "Oh, no... I want them to see what they have done to Jack." The image of Jacqueline Kennedy in that pink suit, stained with the blood of her husband, is still seared into the nation's collective memory over fifty years later. A pink Chanel suit was worn by Jacqueline Bouvier Kennedy on November 22, 1963, when her husband, President John F. Kennedy was assassinated in Dallas, Texas. Made of wool bouclé, the double-breasted, strawberry pink and navy trim collared suit was matched with a trademark matching pink pillbox hat and white gloves. After President Kennedy was assassinated, Jacqueline Kennedy insisted on wearing the suit, stained with his blood, during the swearing-in of Lyndon B. Johnson on Air Force One and for the flight back to Washington, D.C. with the President’s body. There was long a question among fashion historians and experts whether the suit was a genuine Chanel or a quality copy purchased from New York's Chez Ninon, a popular dress shop that imported European label designs. A number of sources claimed it was more than likely a copy of a Chanel pink bouclé wool suit trimmed with a navy blue collar, some asserting it was made by Chez Ninon in 1961. Further complicating the matter was the indisputable fact that the First Lady's "official" designer was Oleg Cassini who provided much of her public as well as private wardrobe. 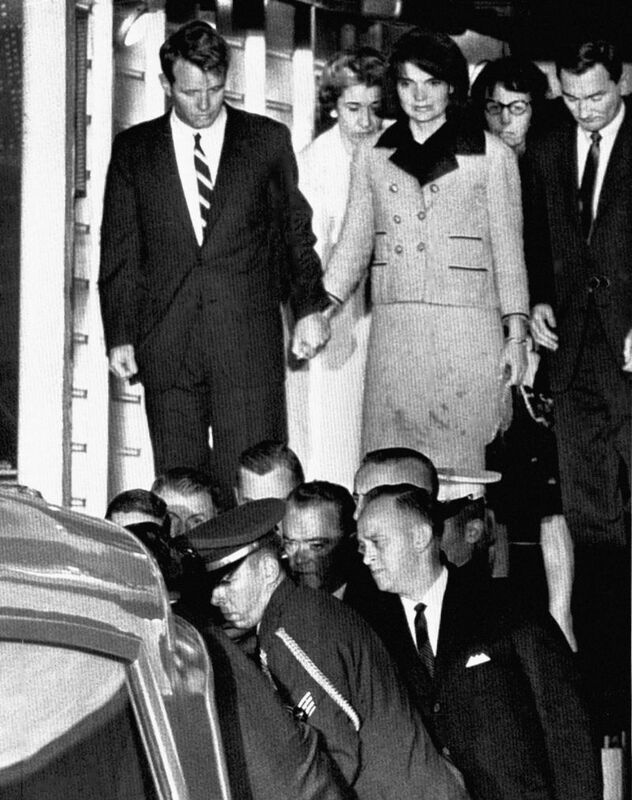 President and Jackie Kennedy on that fateful day in Dallas. 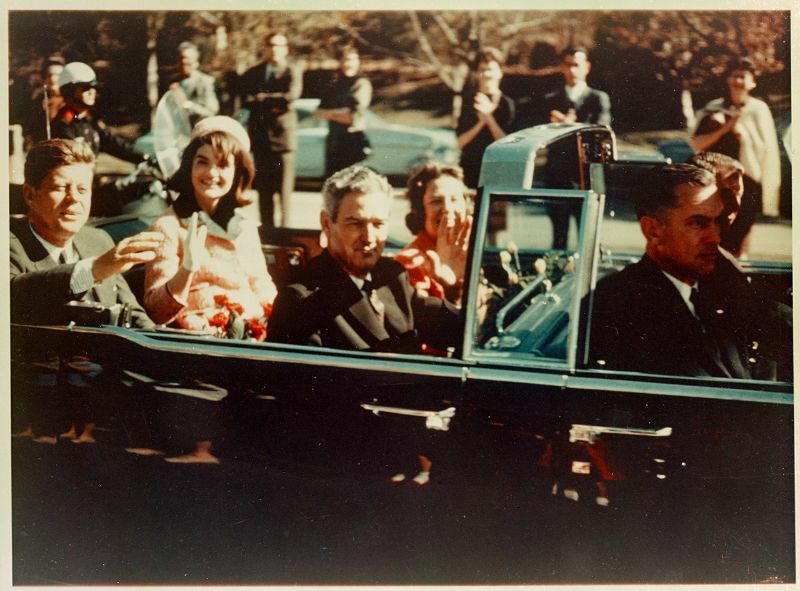 Jacqueline Kennedy was seated to the left side of the President in the back seat of the open-top presidential limousine as the vehicle traveled through local streets in Dallas. Immediately after he was shot in the head, her suit was spattered by his blood. Upon arriving at Parkland Hospital, Vice President Lyndon B. Johnson's wife Lady Bird saw the car and said: "I cast one last look over my shoulder and saw in the President's car a bundle of pink, just like a drift of blossoms, lying in the back seat. It was Mrs. Kennedy lying over the President's body." JFK Motorcade just before assassination. At the hospital, Mrs. Kennedy continued to wear the blood-stained suit, but she had removed her hat. William Manchester wrote in Death of a President: "The Lincoln flew down the boulevard's central lane; her pillbox hat, caught in an eddy of whipping wind, slid down over her forehead, and with a violent movement she yanked it off and flung it down. The hatpin tore out a hank of her own hair. She didn't even feel the pain." The whereabouts of the hat today are unknown, and the last person known to have had it – her personal secretary, Mary Gallagher – will not discuss it. Several people asked Mrs. Kennedy whether she would like to change her suit but she refused. When Lady Bird offered to send someone to help her, she responded: "Oh, no ... I want them to see what they have done to Jack." This photo was taken shortly after Air Force One carrying the dead president's body had landed at Andrew's Air Force base. 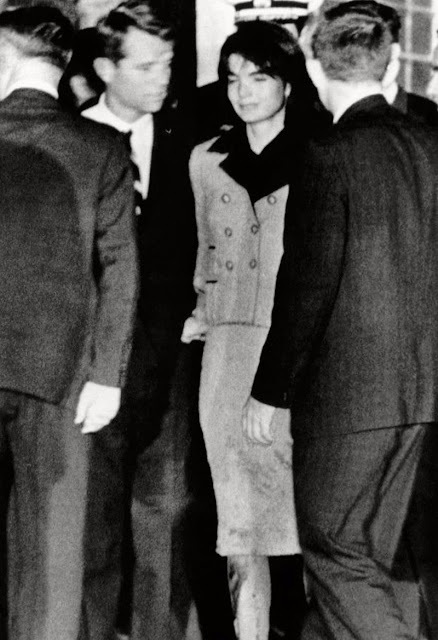 Robert Kennedy immediately boarded the plan and rushed to be with Jackie in her time of need. 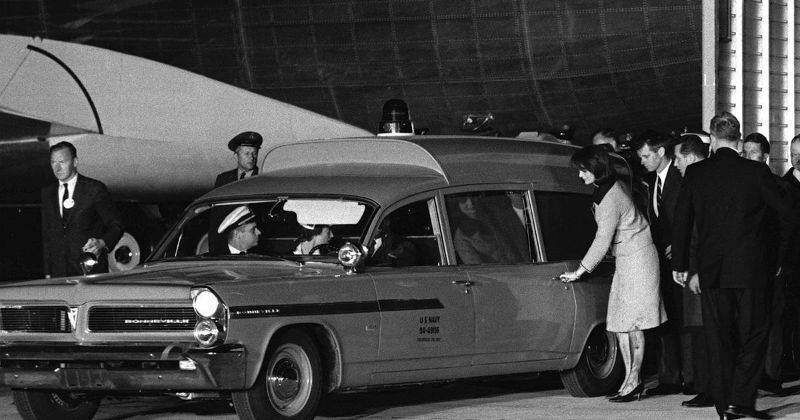 The photo shows Jackie about to enter the Navy Ambulance for trip to Bethesda Naval Hospital. At Andrews Air Force Base in Washington, D.C., JFK's brother Attorney General Bobby Kennedy meets Jackie Kennedy when she arrives on Air Force One with the coffin carrying her slain husband's body. Note Jackie's bloodstained suit. Her left leg is caked in blood. 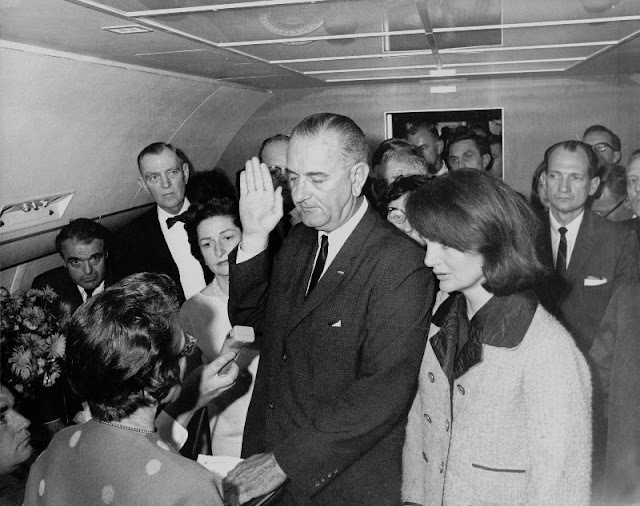 Just hours after her husband's assassination, widow Jackie Kennedy stands next to Lyndon Johnson on Air Force One as he is sworn in as the 36th President of the United States. Although her personal assistant laid out a fresh change of clothes on her bed aboard the plane, Jackie refused to change out of her blood-spattered clothing. Also aboard Air Force One was the casket carrying the body of President John F. Kennedy, age 46. When Jacqueline Kennedy finally removed her suit the following morning, her maid folded it and placed it in a box. Some days after the assassination this box was dispatched to Kennedy's mother, Janet Lee Auchincloss, who wrote "November 22nd 1963" on the top of the box and stored it in her attic. Eventually the box was given to the National Archives in Maryland, together with an unsigned note bearing the Auchincloss letterhead stationery. 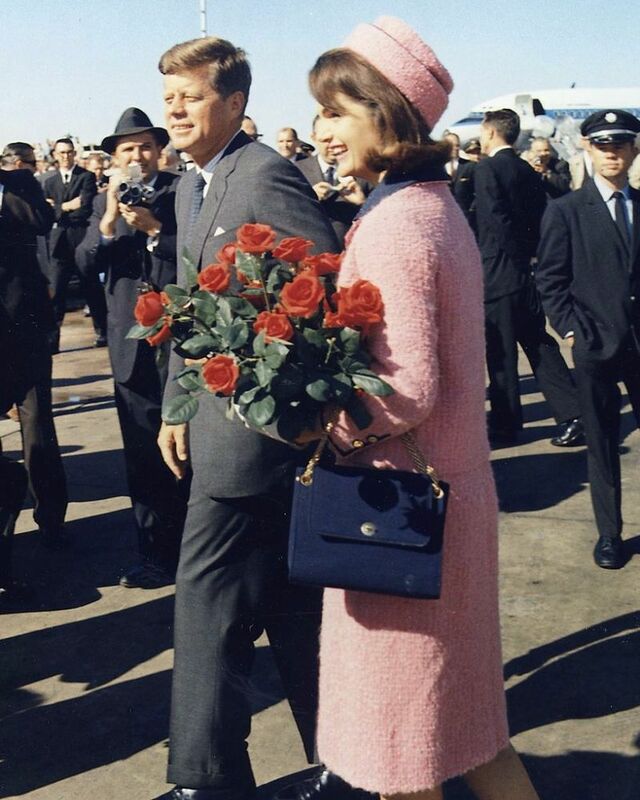 The note read: "Jackie's suit and bag worn Nov. 22, 1963." The suit, which was never cleaned, is kept out of public view in "an acid-free container in a windowless room ... the precise location is kept secret. The temperature hovers between 65 and 68 °F (18 and 20 °C) degrees; the humidity is 40 percent; the air is changed six times an hour."